This class in the Hurst Festival is for those of you who have always wanted to make your own quilt, but don’t know how! Using your sewing machine, it will be fun and fast for you and full of challenges, you didn’t think you would have. Still at the end you will have a quilt you have made yourself using either a set of Charm Squares (5″ squares of fabric x 42 squares which a fabric manufacturer has put together from a range of fabric to encourage you to try to sew a quilt) or a Jelly Roll (2 1/2″ by the width of fabric strips from a range of fabric). Below – in the picture the rolls are jelly rolls and the small packs are Charm Packs. So this is how the class works – if you know about charm squares and/or jelly rolls and want to source the fabric and materials yourself, then at the bottom of the page are the details of each quilt. If you, however, think you might be a bit out of your depth, then we have set out to help you. The easier of the quilts is the Jelly Roll Quilt. It is a super and, depending on the jelly roll, very colourful quilt and makes up to a 52″ x 72″ with a binding but no border. A fun and fast quilt to make up. All you need to do is choose a Jelly Roll from a shop near you and they can also help you buy the other items you need. Cost for the fabrics will be about £55 to make a nice throw to put on a bed or wrap around you on a cool evening. 1 full (42 strips) jelly roll, scissors; 60 cm for 4.5” border, optional(pick one of the fabrics from your roll and use that for the border and another for the binding. Wadding for quilt 60”x 74 – get a pack that has a minimum of those dimensions. Cotton/polyester is good, but know the minimum distance the wadding needs to be quilted. 2 metres backing for quilt – Ikea has some good light weight fabrics that are 60” wide – super for this quilt. I also bought 2 fat quarters to make my irregular circles on top for quilting. 45 five inch charm squares- 3 more than are usually in a normal charm pack which have 40-42 – so either acquire a small bit of that fabric range for the extra squares you need OR from your stash that still has the feel and colours of your charm pack. extra neutral colour fabric of 3/4 yard– now I bought a quiet beige fabric with quiet dots on it – to give some movement to the quilt. You could buy a solid or we call these fabrics ‘blenders’ which work with the fabric. The quilt finishes about 40” square – if you want to add a 4” border you will need .60 metre. Binding slightly less – .50 to make 180” strips. With border the quilt finishes 48″ square. So it is up to you which you do. Wadding needs include – 52” square if you’ve added a border. (Wadding varies when it comes time to quilt the quilt. Some require quilt every 4” and others go as far as 10”. I would recommend that you buy a cotton/polyester wadding – with a quilting distance of 8” or so. Heirloom, Warm and Super Soft all do that. The store should give you a sheet about the wadding when you buy it. If they don’t, ask them about the quilting distance. We have sourced some fabrics and the good prices from Chalk Hill Blue Fabrics at 105 South Farm Road, Worthing, BN14 7AX. 01903 532698 The shop is fairly, new, closed Wednesdays, and the website is not complete as yet. 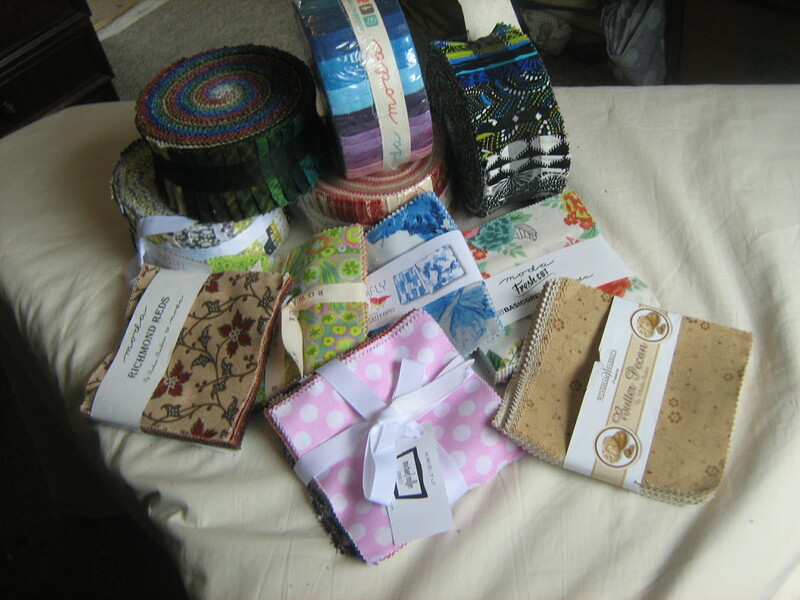 They have a fair selection of both Moda Jelly Rolls and Charm Squares and would welcome a visit. You will be taught how to cut fabrics in the class but Sue at Chalk Hill is happy to help you pick out your matching alternative fabrics for the the charm squares. Sewing machine, needles, manual for your machine, scissors, pins – are required. I strongly recommend you purchase a 1/4 inch presser foot for your machine – if you have a Singer, Janome, Brother, you can buy a generic one for your machine on line. Bernina’s require their own as may well do other less popular machines. Cutting mats, cutters, rulers, ironing boards, irons, etc will be available on the day for you to use. I am happy to have phone (01903 745625) or email discussions with any of you to answer your questions and you can reach me below by filling in the contact form. I check my emails daily and hope to come back to you as soon as possible. I really look forward to this class, one I have delivered many times here in Storrington.